Over time more and more companies are popping up in South Eastern Massachusetts offering roof cleaning services. It makes sense when you take a look at all the dirty roofs! One reason this is a concern is because it is an unregulated industry. There are all sorts of products that you can buy online that claim to clean your roof with an easy application, but none of them work very well. The other downfall is that right now 90% of the local companies are using a pressure washer to get the job done. SERIOUSLY!!! Everyone knows that this is not the way to go. The startup cost of a roof cleaning company using pressure to clean roofs is very cheap. You can do it yourself for under a $1000 (especially if you don’t have insurance). The reason for this low cost is because anyone can walk into home depot and have a brand new shiny pressure washer within minutes. This is the reason the ratio of pressure washers to softwashers is so uneven. Soft Washing systems are far more elaborate and most of the equipment is not locally available, leaving the lazy to the path of least resistance. The startup cost is also on average 10 times more expensive. From our discussions with home owners we have found out that most of these companies do not outright say they are going to pressure wash their roof. They call it a low pressure rinse, or a gentle roof scrub, which is obviously not true. We have been teaching homeowners that if in the roof cleaning process they ever hear a gas engine running that a pressure washer is in the equation. 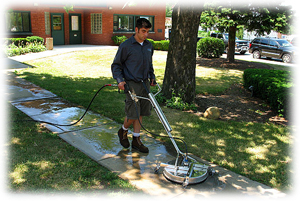 There are also a couple of cleaning devices used in conjunction with pressure washers, and the pictures of these devices in action are below. Both of these tools have a high pressure hose that connects them to a pressure washer. The one on the left is called a p I t c h – w I t c h and looking at the picture you can see it has 3 to 4 nozzles which are the same nozzles that you see on a typical pressure washing wand. So instead of one nozzle putting out up to 4000PSI that power gets divided into 3 or 4 nozzles. If you do the math it is still about 9 times more pressure than recommended by the roofing manufacturers. The tool on the right is called a r o o f - r o v e r and is essentially the same thing. Although instead of having up to 4 nozzles it has 2 that spin in circles and are mounted to a spray bar. This tool is actually made to clean concrete and has been modified by its distributor to be used for cleaning roofs. Does this tool to the left look familiar? It is the rover in its original form. Even if these tools were safe to be used on a roof and the roofing manufacturers said it were ok there is still 1 major pitfall… Your clean looking roof won’t stay that way for long because the algae was not killed, it was merely forced deeper into the pores of the shingles or under them if it is an asphalt shingle, leaving it alive and ready to grow back. That is why these companies don’t ever offer more than a 2 year guarantee. If you would like more information on pressure washing disguises in Cape Cod, please call 508-209-7795 or complete our online request form.